The Park Ranger 2150 is the basic machine for an all-season range of Park Ranger attachments. Articulated and just 1 m wide, the Park Ranger utility machine provides professional performance in even the tightest spots and is easy to manoeuvre thanks to its servo steering and a turning radius of just 1.5 m. Four-wheel drive and 28 hp ensure strength and power in all work situations. 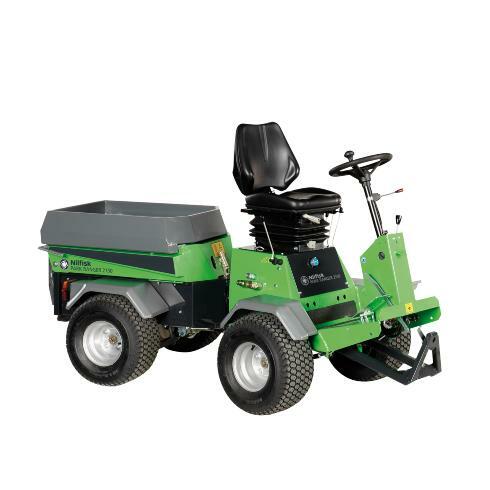 The Park Ranger 2150 is fully hydraulic and extremely simple to operate. It features no mechanical parts such as fan belts, chains and crank shafts, so it contains very few wearing parts. The utility machine therefore requires only minimal maintenance and is remarkably durable. The same applies to the attachments, which are all custom-made for the Park Ranger 2150. Once they are fitted, they become an integrated part of the machine, thus ensuring that it always retains its compact form.